Photo on right is 1018-34. 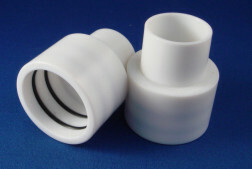 Large end has 1-3/8 inch (35mm) ID O-ring fitting. #1000 mouthpiece, or KM mask. Small end ID fits # 1022, 3420, small end of 1088 adapter to connect to 2 inch ID. Use it to fit 2700 or K-valve mouthports to KM mask. same as IBE191, except small end is 22mm OD / ~18mm ID. mounts throu panel up to 1/8 inch thick with counternut. Material: White Delrin.